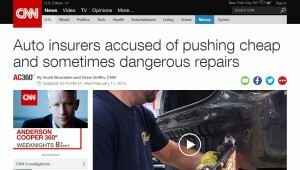 A mysterious phone campaign has been making the rounds of the collision repair industry Monday morning, asking body shop professionals their thoughts on a controversial “Anderson Cooper 360” piece. The call, from someone named “Grant McNeely” (the spelling is obviously unclear) leaves an email message linked to the domain www.cnnfollowup.com, which itself links back to the article on the original Feb. CNN “AC360” piece. The caller seems to imply he is from CNN, though he doesn’t say it directly. A CNN senior producer has said it was not from the network. He then starts to give a number, getting as far as “1-800-26–” before reversing and asking the recipient to email him at the CNNfollowup site. It appears to be a robocall; another version provided to Repairer Driven News seems to start in the middle of the message. Repairer Driven News has obtained a copy of the complete call. Listen to it here: Call from “CNNfollowup.com” seeking comment. We’ve left a phone message at a number displayed on caller ID and also emailed the email address provided in the call. Caller ID reveals a number linked to rural Rhododendron, Ore. The location and a WHOIS search for the CNNfollowup domain also indicate the person has no affiliation with CNN, which is headquartered in Atlanta, Ga.